It's here. 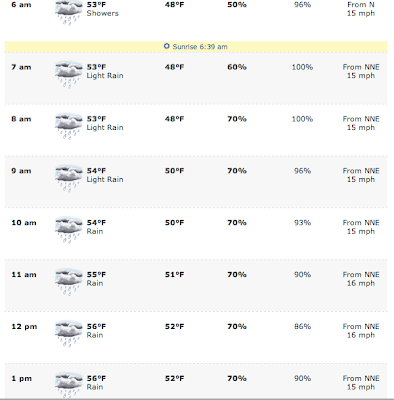 I never thought it would get here, but low and behold - I will be running my 1st Marathon tomorrow morning! And you know what? I feel ready for it (well, right now I do). I went down to Portland this morning to get my bib and shirt for a few of reasons. 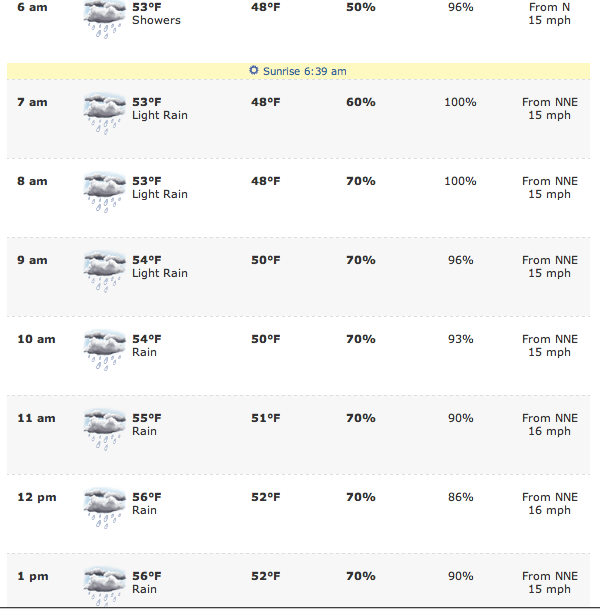 #1 - I don't like feeling rushed the day of a race, so this means I have one less thing to worry about tomorrow morning. 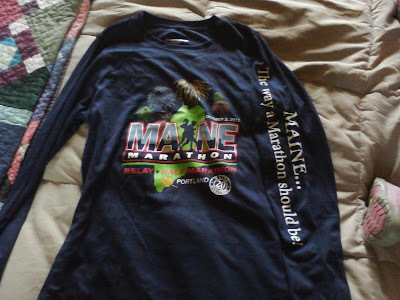 #2 - Last year, my shirt was too big (we waited to get shirts on race day) for my 1st half marathon - which meant Ward got 2 shirts and I didn't get a thing. Ugh. I wanted this year's shirt to fit because I think I'm going to wear it for a week, with my medal. #3 - A trip to Portland = a trip to Trader Joes. Love that place! Anyway, Izzy and I got to the USM gym at 10:50 and the doors were open already and people were walking out with their bags. I thought packet pickup didn't start until 11? This was great because I didn't have to wait! 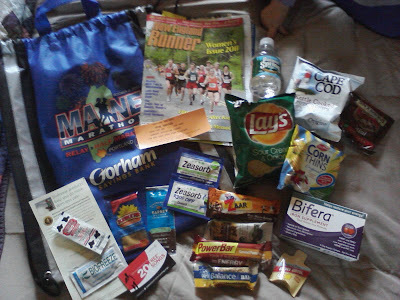 I went in, looked up my number, then found the right spot to go and claim my bib # and goodie bag. The volunteers behind the table were super sweet and happy. Another plus. Then the lady directed me to the area for shirts. I walked right down to the table - which was clearly labeled with "women's small, women's medium....men's small, men's medium...."
I asked the woman behind the table for a woman's medium and she told me to try it on because she said they were running small this year. I tried it and it fit perfectly. On our way out of the gym, I saw a display of headbands for Chicabands. 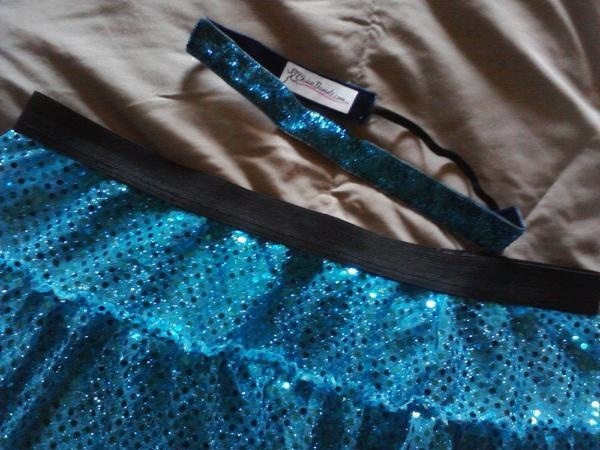 I was immediately drawn to a blue sparkly/glittery headband that would match my traveling sparkle skirt. I had to buy it! Plus, I really felt the need to liven up my outfit a bit more due to the gloomy forecast tomorrow. Am I upset about the rain? Not at all. I've loved doing our long runs in the rain! After a trip to Trader Joes, Target, and Hannaford, Izzy and I got home and I inspected my goodie bag. I was shocked! Look at the goodies in there! This has got to be the best goodie bag ever. Seriously! Now to get ready for tomorrow. I'm going to get my bag packed with race clothes, some extras just in case I'm not "feeling" outfit #1, and shower stuff and warm clothes for afterwards. Oh and I need to get my extra shot bloks in there, Garmin, socks, and shoes. 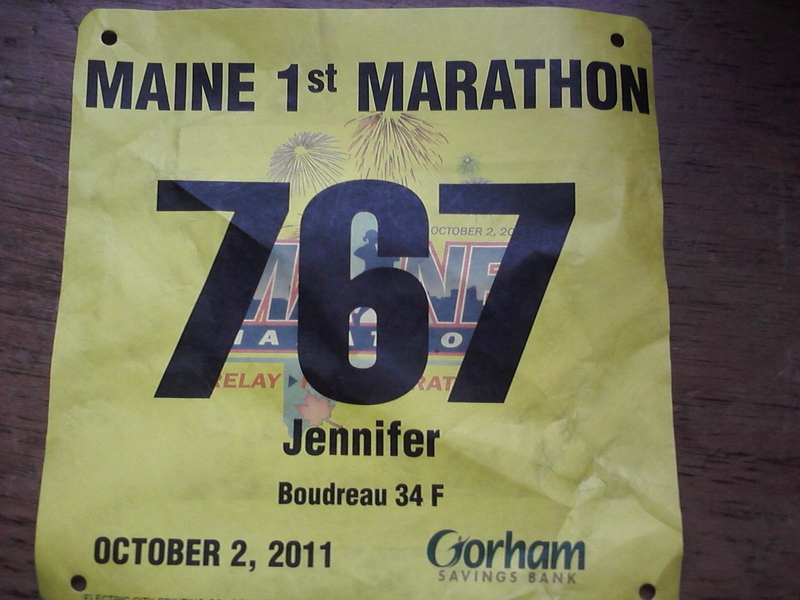 Yellow means - 1st time marathoner! You are READY! And I love how you are drawn to sparkly things. Those headbands are the best - they don't slip at all. I bought a breast cancer awareness one to wear tomorrow. See you at the start line! Have a great night! How exciting! You're going to do great. I love the blue sparkly skirt and headband! Good luck you are going to rock it!! Yay! You did fantastic! Hope you've dried off! Good luck! I'm a little late, but I know you are rocking it today! 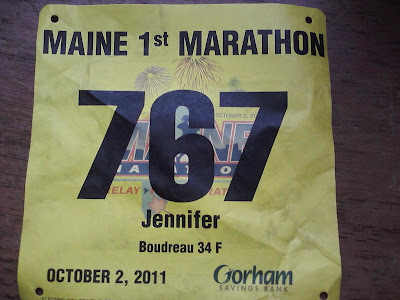 We thought about you today and looked for the sparkle skirt, but couldn't find you ~ probably because you were too far ahead :o) I can't wait to read about your first marathon experience. Congratulations!! You definitely deserve it!